Well that was a number of years ago. I rehappened upon this recipe last week, when I was dejunking my recipes. I knew it had to be fate because this mama was craving a sweet treat something fierce. I checked my pantry and saw I had the stuff to make it. It was like angels singing people...telling me this cake had to be made. I made it that very afternoon. It's super quick to make and was perfect for our Monday night family night treat. We all had seconds. It's just so delicious!! Combine bottom layer ingredients together. Next, press batter into a greased 9x13 pan. Cream together all top layer ingredients. Pour over batter in pan. Bake @350 for 30-35 minutes. oh man that sounds so yummy! Yum, I have seen this recipe floating around the web . . . it looks delish! I may have to give it a try! Thanks for sharing! 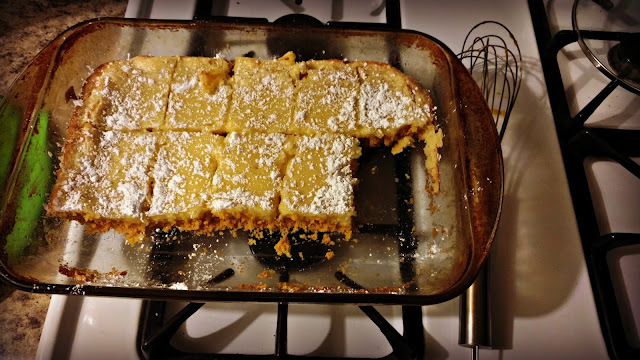 Gooey Butter Cake was created in St.Louis where we live, its a really big deal here. So yummy! There are bakeries in St.Louis that make nothing but different types of Gooey Butter Cake.